I use a log to record the stages the plants go through during the season. I'm looking to see how plants grow in my garden. Weather conditions are added because over time there will be a picture of what plants will do year after year. 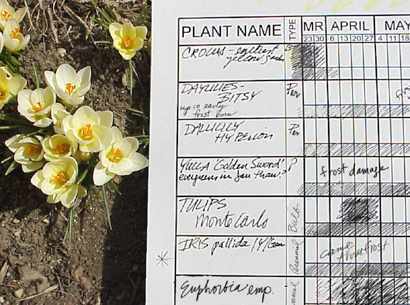 Notes are made for height and width of the plant, color of blooms and foliage. Marks are made when I start deadheading or if I cut back and when and if the plant reblooms. It is useful to know when putting plants together if a plant has fragrance, goes dormant, or has good winter interest. Using this chart, I can visually see when and how long a plant contributes in relation to the other plants in the garden. Keeping a log also gives me another excuse to go out and enjoy the garden.